Travel along the Saigon River to the Cu Chi Tunnels and learn about the underground labyrinth of war-time passageways. After lunch, stop for some bargaining at Ben Thanh Market. Freechoice: Board a sampan to visit the famous Cai Be floating market before stopping at local cottage industries and French colonial or traditional Vietnamese houses. Alternatively relish a later start before savouring morning tea at the French colonial Le Longanier House featuring local musicians and cultural demonstrations. Or stay on board for your special Freechoice activity. Freechoice: Stay in Tan Chau to visit Evergreen Island and enjoy a ride in a Xe Loi to the local Cao Dai Temple. Alternatively choose from two options which cruise by speedboat to Chau Doc. Firstly visit a family-operated fish farm before walking through a Cham village or visit Tra Su Bird Sanctuary. Relax during a full day of cruising as you cross the border into Cambodia. Make use of the ship’s luxury and take the time to enjoy a cocktail by the pool or appreciate some solitude on your private balcony as you watch the scenery pass you by before berthing in Phnom Penh. Freechoice: Journey to the Killing Fields and tour Tuol Sleng, the former school that was converted to the main prison of the Khmer Rouge, or take a guided tour of the local food market before joining a hands on Khmer cooking demonstration. Alternatively, by Tuk Tuk explore Phnom Penh’s colonial buildings, the Central Market as well as its modern architecture before stopping for lunch at a local NGO restaurant which teaches street kids hospitality skills. Drive to Siem Reap and arrive at your hotel, your stylish three night Special Stay. 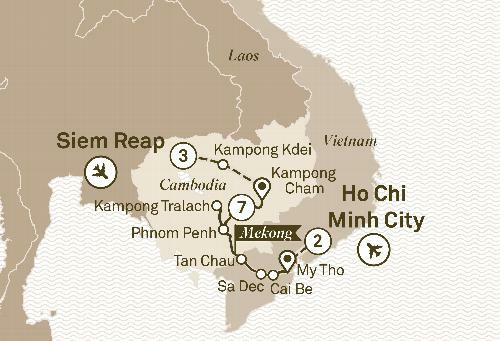 Freechoice: Discover Banteay Srei and visit the Landmine Museum or explore Beng Mealea temples and Artisans D’Angkor. Alternatively, cruise on Tonle Sap or take a tethered balloon ride over Angkor Wat before visiting a Pouk Silk Farm and Preah Khan Temple. For the more adventurous enjoy a vintage Vespa ride. The people who reside along the banks of the Mekong River have learnt to coexist with this mighty waterway. All around are reminders of how nature and humanity can adapt and thrive, living in harmony with one another. After discovering the many riches of Ho Chi Minh City, a thriving metropolis filled with stories and adventures, you’ll spend the first night on board Scenic Spirit settling into the luxurious surrounds that will become like home. From the ancient hilltop pagoda of Wat Hanchey, where resplendent water views await, to the famous Silver Pagoda in Phnom Penh, Scenic will unveil a multitude of experiences to allow you to appreciate the beguiling nature of this landscape, letting you become one with this magnificent waterway.